To be precise, the Tiguan Allspace is 4,701 mm long (Tiguan: 4,486 mm) and has a wheelbase of 2,787 mm (Tiguan: 2,681 mm). A third row of fold-flat occasional seats means the Tiguan Allspace can carry up to seven people and still boast a luggage capacity of 230 litres. Or, with five people in the car, the luggage capacity is 700 litres, and increase of 85 litres over the ‘regular’ Tiguan (615 litres). Further emphasising its enhanced flexibility, the Tiguan Allspace’s middle row of seats can be slid fore and aft by 180 mm, and can also fold flat. With both the middle row and the third row of seats folded down, the luggage capacity of the Tiguan Allspace is a cavernous 1,775 litres. Three high specification trim levels make up the Tiguan Allspace range. Beginning with the generously equipped SE Navigation models, it continues with the luxurious SEL and sporty R-Line. Equipment levels are high across the board in the Tiguan Allspace. As well as the third row of fold-flat seats every model has at least 18-inch alloy wheels, parking sensors and 3Zone climate control. All have Volkswagen’s Discover Navigation infotainment system with an 8.0-inch colour touchscreen, satellite navigation, DAB radio and a CD player, as well as Bluetooth smartphone connectivity. Driver assistance systems fitted across the board come in the form of Adaptive Cruise Control, which tracks the speed of the car ahead and automatically accelerates and brakes the Tiguan Allspace while keeping a safe gap ahead, as well as Lane Assist, Front Assist and City emergency braking. SEL spec’ adds Active Info Display, Volkswagen’s 12.3-inch TFT screen mounted in the instrument binnacle. It offers customisable menus that display a range of different information about the car such as speed, gear, fuel consumption, navigation instructions or map, and much more. SEL trim also includes 19-inch alloy wheels, front sports seats with 14-way adjustment, hands-free boot opening, and a panoramic sunroof. R-Line brings a variety of sporty styling cues to the Tiguan Allspace, including 20-inch ‘Suzuka’ alloy wheels, sports suspension (lowered by approx. 15 mm), a body-coloured rear spoiler, and black interior rooflining. Engine options are broadly similar to the Tiguan. The 1.4-litre TSI ACT engine has a peak power output figure of 150 PS (5,000 to 6,000 rpm) and benefits from Active Cylinder Technology, which means two of the four cylinders shut down when the car is cruising to save fuel. A second petrol option is the 2.0-litre 180 PS TSI unit, available exclusively with 4MOTION all-wheel drive and a seven-speed DSG automatic gearbox. The diesel range includes three 2.0-litre turbocharged engines, with peak power outputs of 150 PS, 190 PS and 240 PS. The 150 PS unit is particularly versatile, with the choice of front-wheel drive or 4MOTION all-wheel drive and six-speed manual or seven-speed DSG gearboxes. In 190 PS diesel-engined form the Tiguan Allspace has a top speed, where legal, of 130 mph and completes the 0-62 mph sprint in 8.6 seconds. When equipped with the 240 PS BiTDI engine the top speed is 142 mph and 0-62 mph takes 6.7 seconds. Fuel economy on the combined cycle ranges from 46.3 mpg for the 150 PS TSI to 43.5 mpg in the 240 PS TDI diesel engine. CO₂ measurements range from 131 g/km for the 2.0-litre 150 PS TDI with a manual gearbox and front-wheel drive to 175 g/km for the 2.0-litre 180 PS TSI engine with 4MOTION all-wheel drive. As well as being a strong performer on the road, the Tiguan Allspace is a capable off-road SUV. To that end, the optional off-road pack offers an alternative front bumper design to increase the approach angle from 16.9 degrees to 24 degrees. It also adds additional underbody protection and chrome door sill protectors. 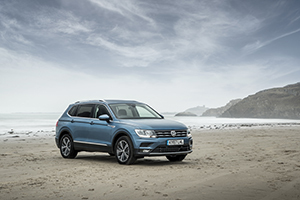 All Tiguan Allspace models equipped with 4MOTION all-wheel drive include 4MOTION Active Control. This is an intuitively operated rotary/push-button switch that allows the driver to activate one of four driving modes: ‘Onroad’, ‘Snow’, ‘Offroad’ and ‘Offroad Individual’. It tunes the transmission of the car to meet the conditions the driver is facing. The versatility of the Tiguan Allspace continues via the model’s towing capacity of 1,800 kg to 2,500 kg (braked), depending on the engine and gearbox combination. Volkswagen’s clever Trailer Assist system combines the optional Park Assist and rear-view camera to make reversing and parking with a trailer easy and accurate. The optical display visualises actual and possible steering angles and reverse steering is automatic, with the driver side door mirror adjustment switch acting as a joystick. The driver controls the pedals and keeps a good look out. From its UK launch in June 2016 to the end of 2017 more than 40,000 second generation Tiguans have been sold here, cementing the car’s position as a top three model for Volkswagen UK. The Tiguan Allspace aims to further strengthen that sales performance as a standalone car. It has been designed to echo the sharp styling of the regular Tiguan despite its larger proportions, and boasts various styling amends including a new front grille and a higher bonnet with different accent lines. Larger rear doors enable good access to the third row of seats, while the contours around the C-pillar are also new. The roof section is finished with a striking structural design that pays homage to classic SUVs. Volkswagen’s SUV range continues to expand. Below Touareg, Tiguan Allspace and Tiguan is the all-new Volkswagen T-Roc, which blends the dominance of an SUV with the dynamism of a compact hatchback. For more details on the new Tiguan Allspace – together with brochures and pricing – and to use Volkswagen’s online configurator, please visit www.volkswagen.co.uk.